Easy Rack is a nationwide pallet rack dealer with regional and local distribution centers located throughout the lower 48 states. Delivery and installation can also be arranged for Alaska and Hawaii. Our philosophy is turn-key customization from the planning stage to the installation of the system. We know the right questions to ask when companies call us that will tell us exactly what type of storage solution will best serve their interests. Whereas other pallet rack dealers waste time by putting their clients on a docket for an onsite visit and measurements, our specialists can gather this information through either phone consultations or emails and then relay the data the design team. 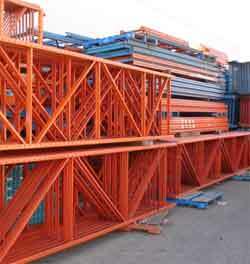 Easy Rack is unique among pallet rack dealers in our ability to reduce product costs without diminishing product quality. Recent growth in our company has allowed us to acquire newer, lighter steel sections that combine corrosion and abuse resistance with cost effective pricing. Further cost effectiveness is generated when uprights, beams, and wire decking are purchased through used sourcing channels, allowing a custom-built storage system to be designed in any number of styles that can offer a savings of as great as 60% off the cost of new materials. Design is perhaps the most crucial component to our service offerings. We decided from the founding of our organization that we would distinguish ourselves among pallet rack dealers as being one of the few that would invest the resources necessary to acquire access to some of the most sophisticated computer programs written specifically for the purpose of pallet rack design. Such factors as warehouse size, product type, industry type, product turnover, and available workforce are all components that frequently find their way into equations that our software uses to develop a storage rack system specific to the facility and the business model. The components we use are treated for greater corrosion resistance, optimal fire resistance at temperatures over 200 degrees Celsius, and painted uniformly throughout to ensure better resistance to abuse and normal wear and tear. Throughout both the design and manufacturing processes, we hold ourselves to strict standards of accountability as a pallet rack dealer. All design calculation and testing methods are performed in full accordance with FEM standards. In todays shifting marketplace, the ability to optimize both space and time to market has never placed a greater demand on pallet rack dealers. Custom storage solutions, which used to be an optional luxury, are now an absolute requirement for businesses looking to minimize risk and maximize return on investment.